My friend Alison Schofield reports that she will be joining a new excavation that is now taking place in a remote Dead Sea cave after a previously-unknown papyrus manuscript was found there by plunderers in 2014 (more here). In November 2014, inspectors of the IAA’s Unit for the Prevention of Antiquities Robbery apprehended a band of robbers, residents of the village Sa‘ir near Hebron, while engaged in plundering the contents of the Cave of the Skulls in Nahal Tse’elim. The suspects were caught “red-handed”, were arrested on the spot, have been investigated, sentenced and served a prison sentence, and are required to pay the State of Israel a fine of 100,000 NIS. At the time of their arrest they were in possession of important archaeological artifacts that date to the Roman period, c. 2,000 years ago, and the Neolithic period, c. 8,000 years ago. In 2009 an ancient papyrus was seized that was written in Hebrew and dates to the Year Four of the Destruction of the House of Israel (139 CE). The papyrus was confiscated in a joint operation by the IAA’s Unit for the Prevention of Antiquities Robbery and the Israel Police during a meeting with antiquities dealers in which the papyrus was offered for sale for the amount of 2 million dollars. The investigation of the robbers involved in the affair showed that this papyrus was apparently also discovered in Nahal Tse’elim. 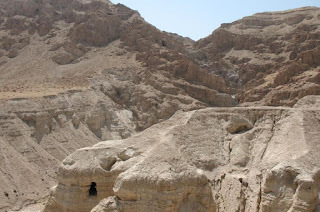 The contents of it, which mentions the towns and settlements in the area of the Hebron hill-country, suggests that the papyrus was part of an archive of documents belonging to Jews who fled to the desert from the Hebron area after the Bar Kokhba uprising. Now, the Israel Antiquities Authority hopes to find such documents. 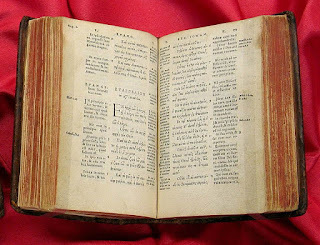 Dallas Theological Seminary’s Turpin Library owns a copy of Robert Stephanus’s 1549 Greek New Testament that was once own by Samuel P. Tregelles and was then given, by his wife, to B. F. Westcott. 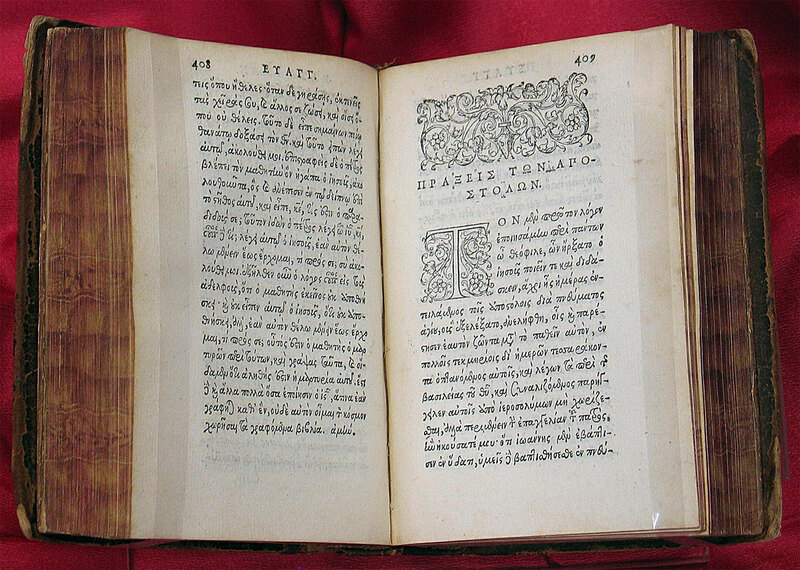 Stephanus, of course, is best known for adding versification to the NT in his 1551 edition. The book was owned by DTS professor J. Dwight Pentecost who donated it to the library. Pentencost was still teaching classes when I graduated in 2012. He was then 93! We used to eat dinner with him fairly regularly because he lived in student housing. He was slowing down by then, but his mind was still sharp. One night I got to talking to him about my text critical interests and I learned that he regularly used a form of the textus receptus for his own study. Apparently Tregelles and Westcott had not worn off on him. If you’re in Dallas, stop by the Turpin Library and check out their nice collection of rare Bibles. I am really impressed with my eight Indiana Wesleyan University John Wesley Honors College students who created the documentary below as part of their HNR 325 Honors Research Tutorial class. I prefer to call it Honors Research Supervision, but that's another story... Keep in mind that this is created by undergraduate students with no formal training in technology or prior background with the relevant historical or philosophical issues. The documentary attempts to interpret the Gospel of Judas in light of related historical documents. The students read broadly, including texts from Plato, Plotinus and Porphyry, Irenaeus and Origen, (not enough time for Augustine), and several texts from Nag Hammadi (Apocryphon of John, Three Stele of Seth and Zostrianus). The students were most enthused with Judas, though, and opted to pool their audio-visual projects into one documentary. Enjoy. in the second line from the bottom. 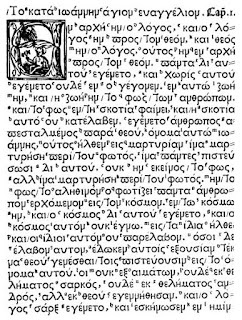 So that you may not be surprised, diligent scholar, or be displeased with us that in the present Greek printing of the New Testament, in a way different from that of the Old, only the letters, without the breathings and accents, have been set in print and published, we have thought it important that the reason for this be made clear to all at the outset. It is as follows. That the most ancient of the Greeks were accustomed to write with out these points (κορθφαί) on the letters is too clear to need many testimonies. For certain old copies (ἀντίγραφα), not a few in number, clearly show this, such as poems of Kallimakhos and the verses of the Sibyll, and carvings of great age on stone in the city, engraved simply with letters alone. So it is quite evident that, in that first bringing into being of the Greek language, the placing on of these small strokes and marks was not devised, nor contributed to the full completeness of the said language in any way. 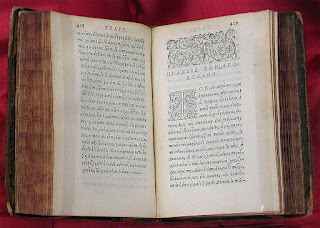 Since also all acknowledge that the whole New Testament, apart from the Gospel according to Matthew and the Epistle to the Hebrews, was written down in the Greek language from the beginning just as it was imparted by the Holy Spirit, we too decided piously to preserve the archaic antiquity and majesty therein of the same language, and to publish the book without the least addition whatever, in the manner of the ancient writings, so that we may not seem to have introduced novelty into something so holy and full of revered lofty thought, by means of alien and new operations imposed on it. Moreover, if the truth be told, the lack of breathings and accents could cause no obstacle to those with any training at all in Greek letters. I mean this with reference to the pure thought of what is said. Instead of accents, the editors used “a simple mark” (κεραία) in polysyllabic words to show where the accent would go if it had been included. This is to aid pronunciation. Interestingly, the vocabulary referencing system between Greek and Latin includes small dots under the reference letter to indicate ambiguous Greek meanings. 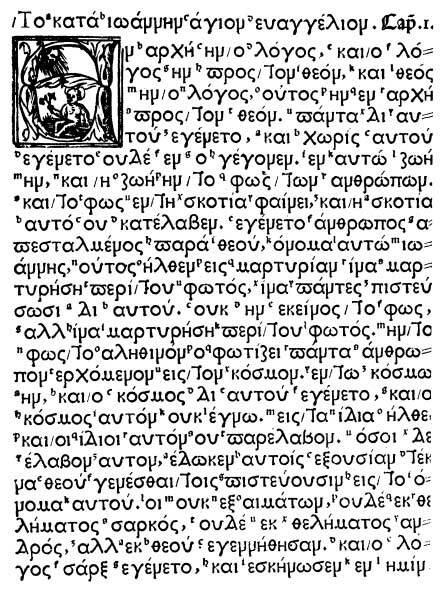 See the dot under the ‘c’ before εγεννηθησαν in John 1.13. The translation above is from John A. L. Lee, “Dimitrios Doukas and the Accentuation of the New Testament Text of the Complutensian Polyglot,” NovT 47, no. 3 (2005): 250–90. For more on the Complutensian Polyglot, see here. Of interest to those readers forced to live in Oxford. The Oxford University Society of Bibliophiles is pleased to welcome Marc Polonsky, trustee of the Polonsky Foundation, who will deliver a talk on the ‘Digitisation of Cultural Heritage’. The Polonsky Foundation, originally founded in 1985 by Dr Leonard Polonsky, an Oxford alumnus (Lincoln), has devoted a large amount of energy and resources to the digitisation of significant representatives of our written cultural heritage, in an effort to democratise access to some of the greatest treasures of humanity, too often unknown to the wider public due to their own rarity. Over the last few years, in particular, the Polonsky Foundation has cooperated with a number of major libraries and institutions, including the Bodleian and the Vatican Library, to sponsor one of the greatest digitisation projects of manuscripts and early printed books in the world. Marc Polonsky, son of Leonard Polonsky, is a leading lawyer in corporate law and mergers and acquisitions (White & Case), specialising in Russia and Central and Eastern European countries. An Oxford alumnus himself (Univ), he divides his time between legal practice and the Polonsky Foundation. was the first to add verses to the NT. A few days ago I stumbled across a case of differing versification. If you check your NA or SBLGNT, you’ll find that the phrase Γράφω ὑμῖν, παιδία, ὅτι ἐγνώκατε τὸν πατέρα occurs at the start of 1 John 2.14. It’s the same in Tregelles, WH, and Merk. But if you are dutifully reading your Robinson-Pierpont text (so as not to miss any Byzantine readings), you’ll find this phrase at the end of 1 John 2.13. That’s also where it is in Elzevir, Mill, Wettstein, and Tischendorf. A quick email to Maurice Robinson alerted me to Ezra Abbot’s collation on verse division. In all, he catalogs 71 cases of variant versification in 60 editions or translations. (And here I was thinking I had found something unique.) In the case of 1 John 2.13–14, the discrepancy goes back to Theodore Beza who seemed to struggle a bit with decisiveness. In 10 editions, he is split 5-5 on where to put the phrase in question. Beza followed Stephens’s  division into verses, with some variations, in the first edition of his Latin translation of the Greek Testament, published at Geneva in 1557 (this is the date at the end of the volume; the title-page is dated 1556), already referred to as the second volume of Robert Stephens’s Latin Bible of that year. In his first edition of the Greek New Testament accompanied with his Latin version and notes, Geneva, 1565, fol., and in his numerous subsequent editions, Beza deviated much more frequently from the verse-divisions of Robert Stephens; and his editions had great influence in giving currency to the use of the division into verses, which soon became general. His variations from the division of Stephens were largely followed by later editors, especially the Elzevirs, who also introduced others of their own (p. 466). I asked Dirk about the Tyndale House GNT and he said there were quite a few places where he would have liked to adjust the verse boundaries but didn’t. I’d like to know if this causes any problems for Bible software. Has anybody seen this? Currently, it has 30% on Rotten Tomatoes. Hired by an ambitious small-town pastor to find sacred relics in the Holy Land, a self-proclaimed Biblical archaeologist comes up short and his attempt to cover up his failure fuels a comic conspiracy from the filmmaking team behind Napoleon Dynamite and Nacho Libre. 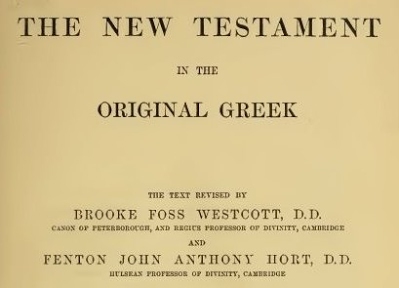 Today marks the 135th anniversary of the publication of Westcott and Hort’s momentous edition The New Testament in the Original Greek. The date was May 12, 1881 (see FB discussion here). Later in the same year they would publish their introduction and appendix justifying and explaining their text critical method. 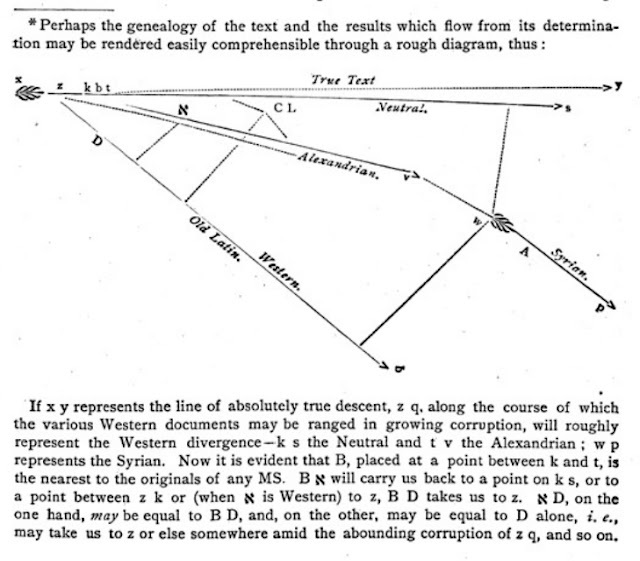 Though certainly dependent on the work of many pioneers before them, it was especially the clarity and power of the argument in their introduction that established Westcott and Hort’s work as not only the high water mark of 19th century NT textual criticism, but, in many ways, the tipping point for the textus receptus. In 1904 the British and Foreign Bible Society would stop publishing the textus receptus and, even before Westcott and Hort went to press, their edited text was being used by the translators of the Revised Version, itself published just days later. 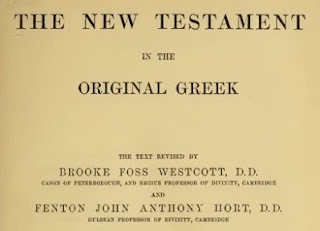 Since then, most English translations of the New Testament have followed an eclectic Greek text. I promised to let you know Macmillan’s answer about the Greek Testament. It has been slow in coming, but is quite favorable. He fully approves of the plan, but leaves all to our own discretion, saying that they will be delighted to “do their part, that is to say, to take all risk and publish, and push.” Besides describing our plan, I told him of my own schemes of examining and restoring (if possible) the texts of the several versions (beside the Peshito, in which we both hoped to effect something), so soon as I should have learned the languages sufficiently: and likewise my intention to go through such of the earlier Fathers as have been examined but cursorily: and likewise to see whether anything can be gleaned from the Latin or cursive Greek MSS at Cambridge. I told him at the same time that these were schemes which might very probably not be realized; and indeed several times urged that there must be no definite agreement, as we might wish to desist for various reasons; I referred in particular to the change in the Greek Professorship which (if Thompson were elected) might cause a good text to be published by authority, and to swamp our edition. He says that no text is published by the Pitt Press [= Cambridge University Press] under the Greek Professor’s authority; but that the Pitt Press merely reprints Lloyd, and Scholefield published a text of his own. He adds that, if I carry out my scheme, our book will be worth publishing, whatever any one else may do. He likewise want to know whether a MS of Photius on St Paul’s Epistles, which Hardwick quotes in a note to his Church History, would be of any use to you. If I were at Cambridge, I would examine it myself, and probably shall do so when I get there. But meanwhile I must tell him that the chances are very small—certainly not enough to make it worth your while to get a Grace of the Senate. He reports that Lightfoot is very much pleased with the proposal to him, and will evidently do the Lexicon and Grammar, though he has not formally undertaken them: he insists on the utmost silence till the books are ready: and Macmillan promises us the same in the strongest terms. *Gordon Fee, “The Myth of Early Textual Recension in Alexandria,” in Studies in the Theory and Method of New Testament Textual Criticism, p. 273. Greek students sometimes get the wrong impression that their Nestle-Aland apparatus records all the variants for the New Testament. I certainly thought this at one point. And it’s not just students. I once heard a story about one of Kurt Aland’s colleagues who called him up in a state of distress because he had found a variant in the Syriac that was not in the NA apparatus! Aland had to break the news to him that this poor variant was not alone. The Nestle apparatus, like most apparatuses is selective. But just how selective is your Greek New Testament? Since we now have complete collations for several small parts of the NT, and since I’ve done the boring exciting work of counting the variants in them, we can now get a sense of just how selective our standard editions are in their apparatuses. Drawing on the data available for John 18, Philemon, and Jude, we can see just how many of the total number of variants the UBS4, NA28, and ECM apparatuses include. It’s not a perfect comparison because these editions all include variants from versions and fathers which the exhaustive collations don’t. They also don’t necessarily share the same variant units either. But for giving a general sense of the data, I think these comparisons are helpful. From these numbers we can see just how selective the UBS and NA apparatuses are. 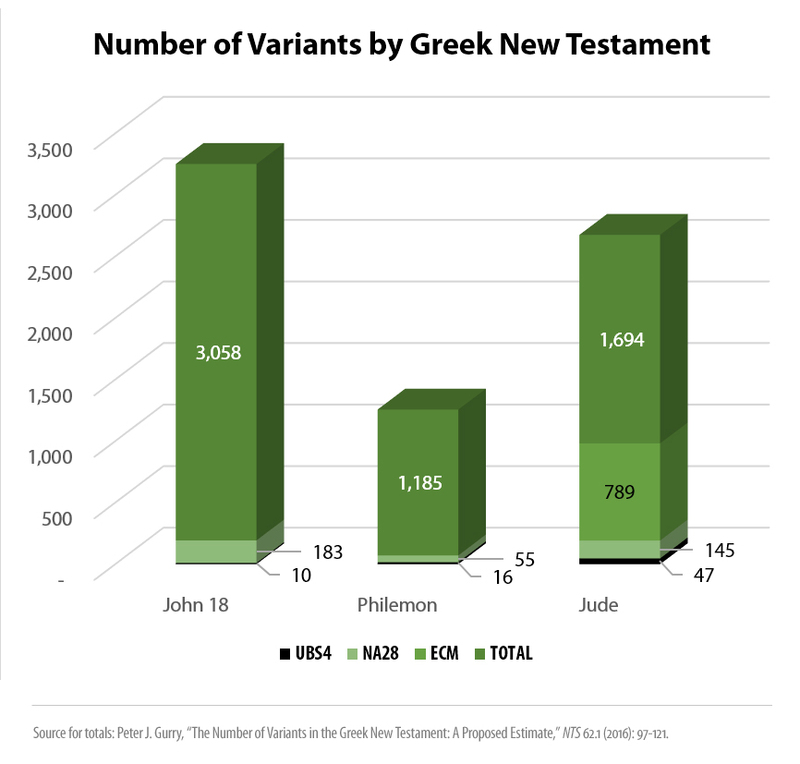 In the UBS, we only get 0.3 percent of the total variants in John 18 and it’s still only 2.8 percent in Jude. The NA does better, of course, but it is still just a drop in the bucket of the total number. Somewhat surprisingly, even the ECM with its extensive apparatus comes in below 50 percent. I see at least two conclusions we can draw from these comparisons. The first is that unqualified claims that most of our variants were created early on are simply false. Given that the NA, UBS, and ECM apparatuses all lean heavily toward the earliest evidence, it follows that the bulk of our variants were created (or at least are first attested) later on. In Jude, for example, over 53 percent of variants don’t show up in an edition that represents the text’s first 1,000 years of development (i.e., the ECM). So we cannot blithely claim that most of our variants were created early. 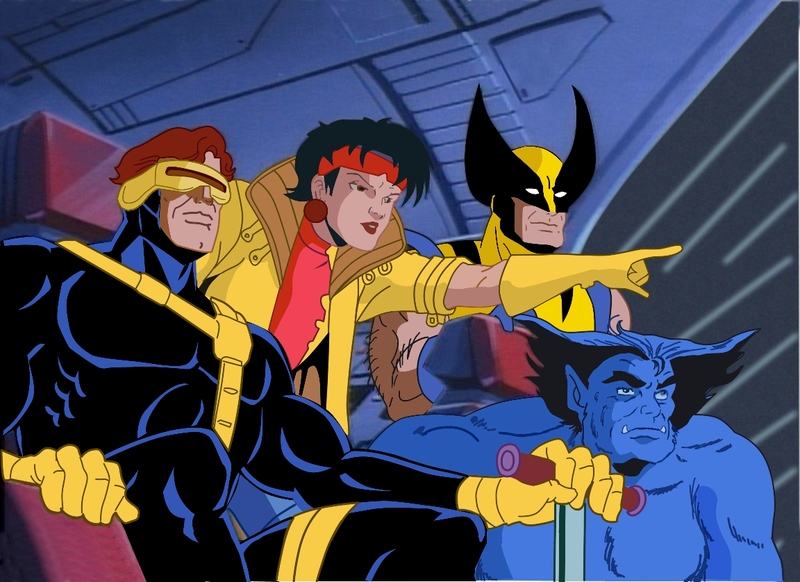 It may be true that most of our most interesting or most important variants were created early, but that would take us well beyond the time I have for this blog post. Second, insofar as these editions succeed in presenting the most significant variants for exegesis and translation (I’m thinking now of the NA and UBS editions), we can conclude that most of our variants are pretty insignificant. Now that phrase “insofar as” is a pretty important qualifier and I can already hear many astute blog readers protesting that the NA/UBS editions leave out too much of value. I hear your protest. But editors have to draw the line somewhere and I don’t envy them for that. Even knowing that editors leave out some readings we think should be there, my comparison here still give us at least one concrete way to answer the question “How many variants matter?” If we adjust the question to “How many variants mattered enough that the editors included them in my Greek New Testament?” the answer is less than ten percent. HT: Greg Lanier for suggesting the idea. So far as I know, no one has written more trying to tease out the term Ausgangstext (translated as “initial text”) than Eldon Epp in his essay for J.K. Elliott’s Festschrift. There (p. 54) he suggests that the earliest official definition is found in the second fascicle of the ECM1 in 2000. (The term is not used in the first fascicle on James published in 1997.) Later in the essay (p. 61 n. 61) Epp notes that J.K. Elliott reports having heard Barbara Aland use the term in a 1999 German broadcast they were part of together. If so, that would be the first recorded use (yes, we text critics can be pedantic). What I was doing in 1993. After that, the next use I’ve found is in Klaus Wachtel’s 1995 dissertation (p. 45). There may be other early uses which I haven’t found. I know you’ll all be able to sleep better this weekend knowing that. Princeton Seminary has put their old journals online. These go back to 1825 with the Biblical Repertory. There are plenty of essays from the bright lights of Old Princeton. Among the articles is Warfield’s 32-page (!) review of Westcott and Hort’s GNT. Yesterday I also came across some of Warfield’s reviews of Burgon, Scrivener, Kenyon, and a few others. These are from a 1932 reprint. You can download them here. Not a picture of the ending of Mark. For some, the question of whether Mark 16.9–20 belongs to the original text of Mark’s Gospel settles the matter of whether it should be read, preached, and taught as Scripture. For others it’s not so simple. These 12 verses may have been added, but this does not mean they aren’t inspired by God. 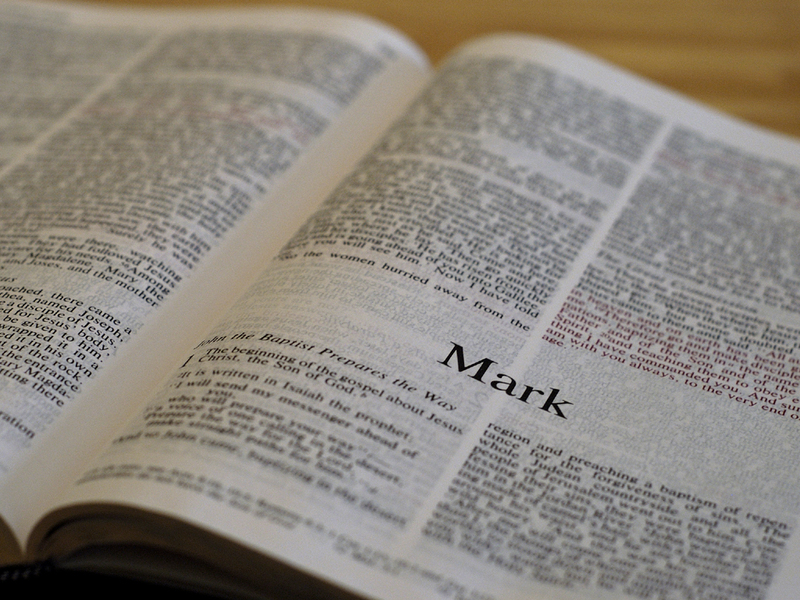 I count myself among that small group that thinks Mark 16.9–20 is not Mark’s original ending but is still Scripture. These verses are attested early and widely and there is nothing in them that I can see that would discredit them theologically. The fact that they have been received by so many Christians as Scripture seems to me to weigh heavily in their favor. But I admit I am probably in a minority in holding this position. So I was glad to find an ally this week in Samuel P. Tregelles who held the same view. I might still be wrong, but at least I’m in good company! I. That the book of Mark himself extends no farther than ἐφοβοῦντο γάρ, xvi. 8. II. That the remaining twelve verses, by whomsoever written, have a full claim to be received as an authentic part of the second Gospel, and that the full reception of early testimony on this question does not in the least involve their rejection as not being a part of Canonical Scripture.